Ever since his career began in 1944, Arthur Prysock had watched musical tastes constantly change. Since then, Arthur’s music had been in and out fashion several times. His fusion of jazz, blues, pop and R&B had proved commercially successful during the fifties and sixties. Arthur’s recording career began in 1959 at United Records, when he released Like Who? Like Basie, with Paul Quinichette following in 1960. Then between 1960 and 1965, at Old Town Records, Arthur Prysock enjoyed the most successful period of his career. After leaving Old Town, Arthur was signed to Verve, Metro, King and MGM. As a new decade dawned, Arthur found himself without a record label. For four years, Arthur Prysock suffered the indignity of being without a recording contract. This all changed in 1974, as he marked his thirtieth year in the music industry. He returned to Old Town Records, where Arthur Prysock had enjoyed the most successful period of his career. By 1976, balladeers like Arthur Prysock were now back in fashion. Lou Rawls, Jerry Butler and Barry White lead the way. Arthur would join their ranks, releasing All My Life, which will be rereleased by BBR Records on 25th March 2013. All My Life saw Arthur Prysock receive a Philly Soul makeover. Taking charge of this was producer John Davis, accompanied by some of Philly’s greatest songwriters, musicians and legendary backing vocalists The Sweethearts of Sigma. Would All My Life mark an upturn in fortune for Arthur Prysock? 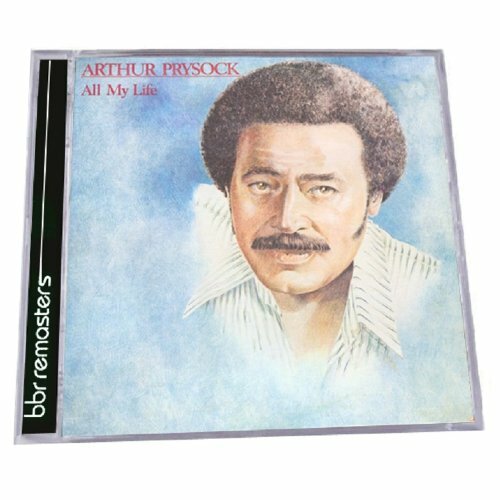 For what became Arthur Prysock’s 1976 album All My Life, John Davis and his cast of Philly songwriters, musicians and backing vocalists got to work. John Davis penned All My Life and One Broken Heart, while Gamble and Huff contributed I Watcha Baby and When Love Is New. Bobby “Electronic” Eli and Terry Collins cowrote This Is What You Mean Tonight, Melvin and Mervin Steals wrote All I Need Is You Tonight and Alex Brown and Dee Ervin contributed Baby I’m The One. The other track on All My Life was I Love Making Love To You, written by Ben Weisman, Evie Sands and Richard Germinaro. With the material in place, recording of All My Life began at SAM Studios in New York, with The John Davis Monster Orchestra accompanying Arthur. When recording of All My Life began in New York, The John Davis Monster Orchestra accompanied Arthur. This included the rhythm section of bassist Michael “Sugar Bear” Foreman, drummer Charles Collins and guitarist Dennis Harris. Larry Washington played congas, John Davis played saxophone, flute and keyboards, while strings came courtesy of Don Renaldo. Together with a horn section and backing vocals from The Sweethearts of Sigma, Carla Benson, Evette Benton and Barbara Ingram, Arthur Prysock was given a Philly Soul makeover. Would All My Life revive his career? The two Gamble and Huff penned tracks were released as singles. First up was When Love Is New, released in October 1976. It reached number sixty-four in the US Billboard 100, number ten in the US R&B Charts and number eleven in the US Disco Charts. When All My Life was released in December 1976, it reached number 153 in the US Billboard 200 and number thirty-six in the US R&B Charts. Then in February 1977 I Wantcha Baby reached number forty-three in the US R&B Charts. After being out of fashion for several years, it seemed musical fashion and Arthur Prysock fortunes were revived by All My Life. Now into his third decade as a recording artist, Arthur Prysock was back, with All My Life, which I’ll now tell you about. Opening Arthur Prysock’s All My Life is the Gamble and Huff I Wantcha Baby. The lushest of strings, pulsating rhythm section and percussion join cooing harmonies from The Sweethearts of Sigma. They give way to Arthur’s sultry half-spoken vocal, before he unleashes a needy, heartfelt vocal. By now, the arrangement fuses disco and Philly Soul with sensuality and drama. Horns rasp, strings swirl and harmonies soar elegantly, as Arthur croons his way through the track. His husky baritone is perfect for the lyrics, bringing sass and sensuality to them. All My Life is one of two tracks John Davis wrote. As it unfolds, it’s reminiscent of Barry White, but with an added soulfulness. The Sweethearts of Sigma prove the perfect foil to Arthur’s grateful, impassioned vocal. Their soaring, soulful encouragement inspires Arthur to even greater heights. Meanwhile, the rhythm section add a pulsating, dramatic heartbeat, as strings dance and percussion punctuates the arrangement. Add to this flourishes of piano, sweeping harmonies, searing guitars and thunderous drums, and Arthur out-croons the best of seventies soulful crooners. I Love Making Love To You sees John Davis’ production make good use of The Sweethearts of Sigma’s harmonies. They’re at the heart of the arrangement, cooing and soaring, sensually. Their neediness spurs Arthur on. He unleashes a vampish husky, come-hither vocal. This he does against an arrangement where horns blaze, while the rhythm section inject funk and guitars add a rocky twist. John Davis Monster Orchestra play around Arthur’s vocal and The Sweethearts of Sigma’s harmonies. This allows them to drive each other to even greater heights, as they prove to be a musical ying and yang. Baby I’m The One has a much more understated backdrop than previous tracks. Guitars chime, while the rhythm section, keyboards and rasping horns provide a meandering backdrop. Arthur’s vocal is much more tender, but filled with sincerity and hope for the future. Harmonies from The Sweethearts of Sigma add a tender, assuring backdrop, while swathes of strings and rasping horns play their part in this beautiful Philly Soul ballad. When Love Is New is the second Gamble and Huff composition. Here, it’s given a makeover. The tempo drops, becoming a slow, emotive ballad. Arthur delivers his vocal with a tenderness, assuring, pleading and promising. The Sweethearts of Sigma fill the spaces, their harmonies sweeping in, adding to the sheer emotion and soulfulness. A saxophone solo is dropped at the perfect moment, before the strings, horns, percussion and rhythm section unite, playing their part in another sumptuous slice of delicious Philly Soul. One Broken Heart is the other John Davis composition. It allows Arthur to deliver a hurt-filled, wistful vocal. Tinged with heartache and regret, Arthur revisits his earlier crooning style. Producer John Davis makes good use of layers of the lushest strings, a slow rhythm section and melancholy harmonies from The Sweethearts of Sigma. They provide the backdrop for Arthur’s heartbroken vocal, as he lays bare his soul, hurt and regrets for all he hear. All I Need Is You Tonight was penned by Melvin and Mervin Steals, who cowrote The Spinners’ Could It Be I’m Falling In Love, Gloria Gaynor’s Honey Bee and Major Harris’ Each Morning I Wake Up. It’s an uptempo slice of Philly Soul, which soon reveals its secrets. Keyboards, rhythm section, stabs of horns and dancing strings signal the arrival of Arthur’s deliberate, heartfelt and needy vocal. When Arthur leaves brief pauses, the strings and then horns fill it. Adding to the drama and soulfulness are a harmonic masterclass from The Sweethearts of Sigma. Their cascading vocals prove the perfect accompaniment for Arthur’s pleading vocal. Closing All My Life is This Is What You Mean To Me, written by Bobby “Electronic” Eli and Terry Collins. Strings sweep and swirl, joining cooing, soulful harmonies from The Sweethearts of Sigma. They provide an understated, soulful and quite beautiful backdrop for Arthur’s joyous vocal. Horns growl and kick, strings dance and harmonies cascade as if the everyone in the band is joining Arthur in giving thanks for the love, joy and happiness he’s found. Quite simply, it’s a deeply satisfying and hugely soulful way to close All My Life. The combination of Arthur Prysock and producer John Davis was one made in musical heaven. With John’s help, Arthur recorded All My Life, his best album in more than a decade. This combination of Philly Soul and disco featured eight outstanding vocals from Arthur Prysock. There’s no such thing as an average vocal from Arthur. Whether ballads or uptempo, dance tracks, Arthur was equally comfortable. The musicians that accompanied Arthur were some of the best in Philly. They provided All My Life’s heartbeat, with Don Renaldo’s lush strings adding to the sheer beauty and emotion. Three women were key to the success of All My Life. The Sweethearts of Sigma’s delicious harmonic delights transformed each of the tracks. They were the perfect foil for Arthur Prysock. Their cooing, soothing harmonies were soulfulness personified. Together with The John Davis Monster Orchestra, The Sweethearts of Sigma played their part in one of Arthur Prysock’s greatest albums All My Life, which will be rereleased by BBR Records on 25th March 2013. Indeed, since its release in 1976, Arthur Prysock’s All My Life has become a minor Philly Soul classic, which is well worth discovering. Standout Tracks: I Love Making Love To You, Baby I’m The One, All I Need Is You Tonight and This Is What You Mean To Me. ← PHILADELPHIA INTERNATIONAL CLASSICS-THE TOM MOULTON REMIXES-SPECIAL VINYL EDITION.